It’s beautiful! Can you go inside and take a tour, or is it closed to the public? Yes, the castle is open for visitors, and beside the castle, it is also possible to see collections of of jewelery inclusive the “Crown-jewels”. All of it has been/are owned by “The Crown” – Kings and Queens. I like this series – and I agree about the cropping. If you take our pictures at a high resolution, there are so many interesting ways you can crop them. 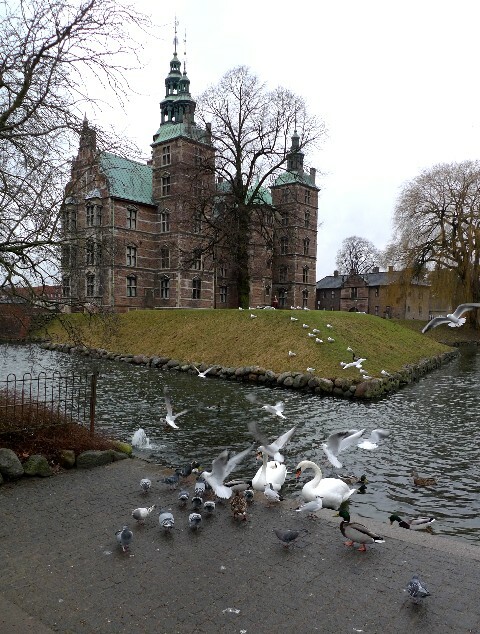 The swans are so beautiful – and the castle looks like an enchanted castle! 🙂 Can you tell us some of the stories? This little castle was build in 1605, as a kind of summerhouse for the King, it was in use until 1710, when the King decided to use it as a place to deposit his and the country’s jewelery. 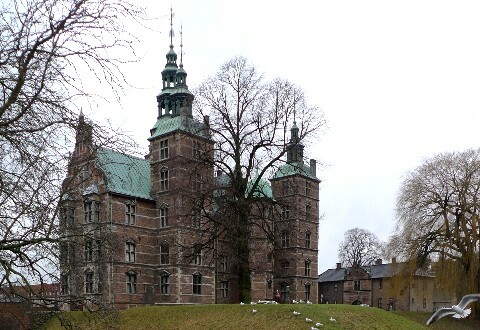 The castle is situated in the middle of Copenhagen, but in the old days, this place was still out at the countryside. It is possible to come in and have a look. Oooh! That would be fascinating!! Very clever, Birgitte! You have such a delightful way of looking at things! The crops are very nice, but the full photo is stunning. The large bird in flight sure catches my eye. That is a castle I would love to go into. Thank you, kcjewel. If you ever come, you can visit the castle, it is open and have exibitions of different kind beside the crown jewels. I think I will go there and take some photos, when the weather is good, I promise to post some of them. That’s a beautiful photo… photos! What a lovely assortment of birds all a-flutter! The different choices you made were all effective, and a lot of fun, too. I had to chuckle–my eyes are weak, and I had to zoom in on the plump brown “cat” that had gotten itself amongst the pigeons! No wonder I lose track of whether I’m coming or going. I am beginning to understand where some of your inspiration is coming from, your imagination are having a great time while you are looking for the zoom button. You are right, this looks like a cat, and from that perspective this would be a most interesting photo. I use to enjoy these kind of mistakes myself, for instance when a headline is read wrong and as so is telling something totally absurd. I liked the the photo of the birds close up, but have to admit that the “whole” photo is my favourite. The reason why is because the seagull on the right, the mass of birds at the bottom and the castle at the top all are strong points in the photo, and I find my eyes travelling from one to another in turn, finding new detail. Thank you kiwidutch, for explaining in details, it is interesting to read. I like the original photo too, it would have been perfect with a little sunshine. Just before I came, an old lady had been feeding the birds, that´s why they were at that spot, and thats why they were so wild. That is a very good way to express it. Thank you Scott.